On a scale of 1 to 10 how would you rate your happiness: a 2,5,8? Historians argue that our generation is actually less happy than our forefathers who didn’t have the vacations, the health benefits and the longer life expectancy that we have today. Interestingly, even with today’s abounding materialism and technology that has made us more comfortable and safer, more people are actually manic and addicted (which I’ll explain in a moment). First of all, we need to understand that inside we all want to be happy. This is a deep innate desire that we all have. We want happiness. We want joy. We want our soul dancing. Granted, many end up cynical about whether happiness is even possible but still the longing for happiness remains. Sadly, you’ll discover the most educated, experienced and wealthiest among us are the most cynical on the subject of happiness. Yet even in the face of cynicism there is no denying this innate need and drive to be happy! Psalm 1 is one of the most famous passages in the Bible – called by some the “gate-keeper” to the entire book of Psalms — some even saying it captures the message of the entire Bible . What’s important to recognize is that once the Psalm acknowledges the reality that happiness does in fact exist, it does NOT then read “Blessed(or Happy) is the man who seeks happiness”. In fact you’ll never be happy if you directly pursue happiness. In some ways it makes matters worse. When happiness becomes the direct pursuit you will either become “manic” or like an “addict”. How? Manic, because your happiness is based on the ebbs and flows of circumstances; like waves on the beach. Depending upon the tide of circumstances, you’ll either be up or down. An addict, because the “right circumstances” only deliver a superficial happiness, not a fundamental and substantive one. On Sunday July 3rd we’re going to study the phenomenal passage of Scripture known as, PSALM 1. From this study we’ll learn four realities about “The Search For Happiness”. #2 The REAL happiness that is offered by God is a fundamental happiness not a superficial one. #3 Happiness can never be found by directly pursuing it but rather by pursuing righteousness. #4 Happiness is not based on what happens to you, but what you choose to do and who you are. The implications of that verse along with the entire Psalm is incredible. I can’t wait to dive in! Tell A Friend And Invite A Friend — Sunday, July 3rd — and let’s see what the Lord Jesus will do. The Lord is doing a wonderful work in our Church Family!! I thought I’d share a picture of our son Pete and the great Head Football Coach of Boise State, Coach Chris Petersen. 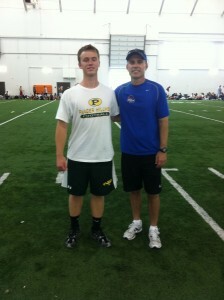 Pete was invited by the Qb Coach of Boise State, Coach Pease, to their Boise State Camp to throw for the coaches. Pete had a GREAT workout and the best part was Pete and I hung together for a few days! The Lord blessed! !